Like your kernels with a side of competition? The package also comes with a voting ballot, so party guests can guess who the winners will be. An included 1-quart tin, also filled with the Chicago mix, goes home with the winning party guest at the end of the night. And — at our party, anyway — that person better make a pretty gracious speech. The tin’s only available through Sunday, so earn your best hostess award by hopping online to order it now. Have fun this weekend, and may the best picture win. 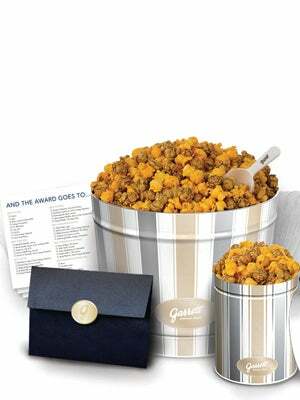 To order the package, visit Garrett Popcorn.